Welcome to the Altenew 5th anniversary blog hop! 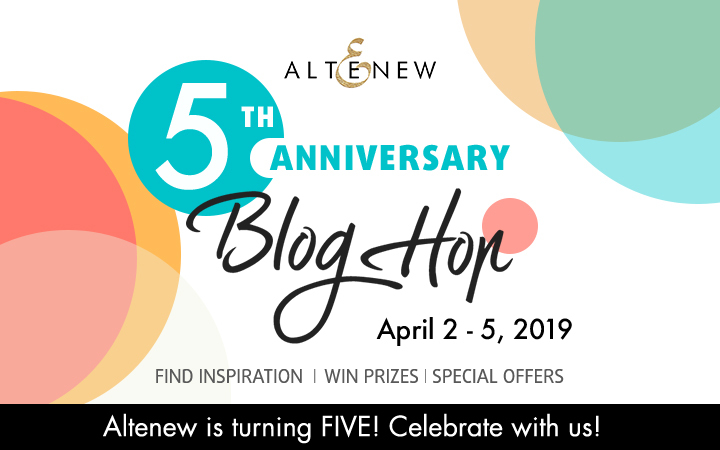 As the name would suggest, Altenew has turned 5 and we are here to celebrate this wonderful occasion with lots of inspiration and awesome prizes! Enjoy hopping along! You should have arrived here from the super talented Keeway's blog! All three cards are on a 5.5x4.25" top folding card base. For one I just stamped the flowers randomly on white card stock and die cut a banner shape from it using the awesome Pocket Banner die. I used this die on all three cards as you can see. I love it so much! I stamped some more flowers on white card stock and die cut them, to create a more dimensional focal point. I added a bit of gold tangled thread for some texture. I love metallic threads! On my third card I first embossed the outline of one of the poppy images using the Pure White Crisp embossing powder. I then added a second, stamped and die cut poppy image. I also embossed the sentiment. 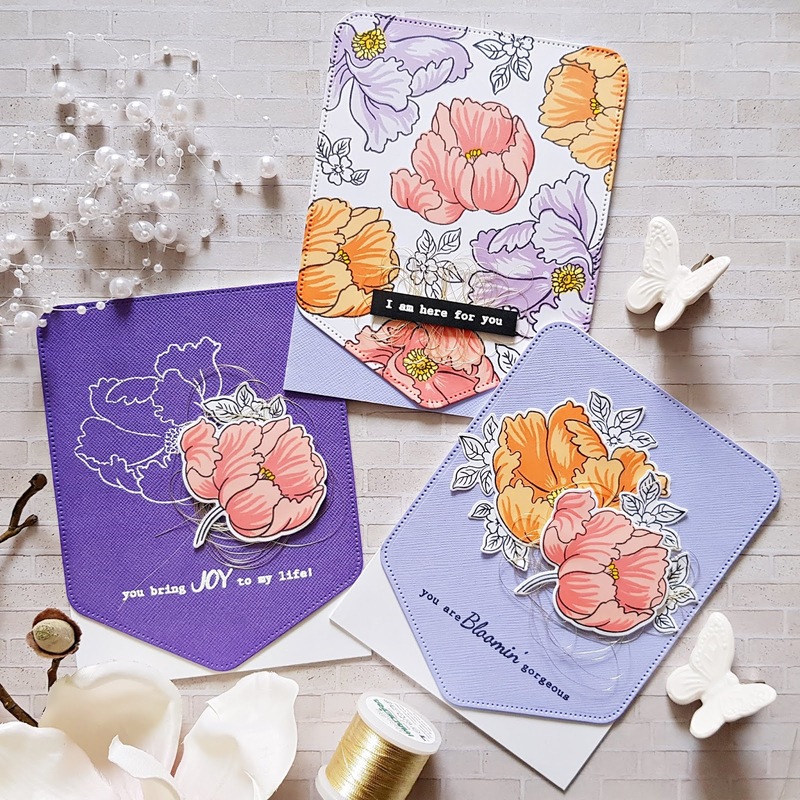 All three sentiments I used here are part of the Build a Flower: Poppy stamp and die bundle. I hope you like how these turned out as much as I loved working on them! Colors and flowers make me happy! Alright, now all the deets on the amazing prizes and promotions because obviously there's no celebration without these right?! Look at all these fab sponsors! Altenew is giving away a $50 gift certificate to FIVE lucky winners as well as an Altenew Academy class to TEN lucky winners! Enjoy FREE U.S. shipping with code HAPPY9M or $5 off international shipping with code SHOPPING9M at checkout. Offer valid from 4/2/2019 at 12.01am EDT through 4/5/2019 at 11.59 pm EDT. Not valid on previous purchases. Cannot be combined with other promo codes. For your convenience, I'm including today's Blog Hop order below! Thanks for stopping by, good luck and have a lovely day! Zsóka Markó --- YOU ARE HERE! I love all of these pretty shades of purple! Your designs are always beautiful, and I love seeing them on Altenew! So gorgeous! I love Altenew - Happy 5th Birthday!!! So pretty! Love the color choices! I can't get enough of all these beautiful flowers. Gorgeous! All 3 cards are absolutely gorgeous. I love the shaped cards, and the color pallette is beautiful. Thanks for sharing. I’m so in love with Altenew!! Can’t earn money fast enough to buy all the ones I want but I do have quite a few … about 70 sets to be exact! So happy to be able to purchase them here in Germany!! Congratulations Altenew! And thank you Zsoka for all your ideas and know-how!! Love the purple/ orange combo. Beautiful. Your cards are really pretty! I love the die cut you used to frame them. The color palette is awesome and I love that you don't worry about what colors flowers are in nature. I am the same. I also love the thin line embellishment you used. Thank you! I love your colors! Gorgeous cards! Beautiful! I love these pastel colors together. Love what you did here! Great color. Wonderful cards! love how you used the stamps. Happy Anniversary to Altenew, and thanks for being part of this blog hop! Love these cards and Altenew. Lovely cards designs Zsoka! The colors are very pretty and those flowers are gorgeous. Thanks for the inspiration! Love these beauties! Happy Birthday to Altenew! Your cards are so pretty. Happy 5th Anniversary Altenew. Love your card - it looks like little pockets; Happy Anniversary Altenew! Very pretty cards! Happy 5th Birthday to Altenew! Absolutely stunning work. Beautiful job. Happy Anniversary Altenew! I adore your cards, especially using the pocket banner die, I must get this too. How did you use to emboss the top fold - I love the texture. What pretty cards. Happy Anniversary Altenew! Love your products. I love flowers and color also. All three of your cards are beautiful. I especially like the white embossing. Such pretty cards Zsoka. Love the lovely flowers especially with the banner. Happy Anniversary Altanew! Three beautiful cards from one set. Thanks for some great inspiration and to Altenew,too for lots of good designs. My growing collection outgrew it's space and now I have to reorganize. LOL! Beautiful cards and I love how you used the die. Such a great collection! Gorgeous cards Zsoka. The soft stamping is very springy. Absolutely beautiful cards! I hadn't seen that cool pocket die yet, what a great way to use it! Love this post! HB Altenew! I love the use of one stamp 3 ways. I love the pastel look of these beautiful flowers. Happy Birthday Altnew, loving the pocket and all your layering... beautifully done..
Gorgeous cards! Love the pretty flowers. Lovely cards. I like the soft colors on these beautiful flowers. Beautiful cards and a great reminder that spring is on its way! WOW I really enjoy this time of year with plants starting to grow and the colors. . . Your ink and paper choices are perfect for the season and cards are beautiful!! Thank you for sharing a fun way to use the Banner die. Love the pastel colors you used. Your cards remind me that Spring is on its way. All three of your cards are beautiful but I gravitate to the dark blue card the most. I like the look of the white embossed flower as a sort of background to the colored flower. Your cards are "bloomin" gorgeous!! And I love the colors you chose. Thanks for sharing! Love your cards...the colors and the backgrounds remind me of spring time. Thanks for sharing your talent. Lovely cards. I like the idea of just coloring flowers in whatever appeals to you. It opens up the design to so many possibilities. 5 years of happiness and inspiration with Altenew! I think you are quite right to use whatever color speaks to you Zsoka - the poppies look lovely on your cards. These are all so pretty. Love the soft colors and the white embossing on the one is gorgeous! Simply adore these cards and your color combination! The stitched die on the textured card stock makes it look like fabric. These cards are so pretty! Thank you for sharing! Love your color choices and the banner die really ups it a kotch, while keeping it CAS. Wonderful cards, the banner cut is a great choice. I like how you used the banner die for the shape of the card base. It's not the standard shape size. I like the purple the best. Great job. Lovely cards and a unique design. Beautiful cards. I love the style and the colors, and the Poppy set is gorgeous. Love those cards! The purple is fantastic - and great Altenew products! How beautiful each of these are! Purple is a favorite of mine! Absolutely love the colors. So beautiful, very inspirational. Lovely job. Thanks for sharing your creativity! Great cards, love your colors! Love your card design and coloring. Love the banner die, It really sets off the flowers. Love all the cards and love the way you showed that they can look different on each individual card. Banner die also makes the card have a different accent then just a 4x5 card. Colors were great. These are lovely. I really like the addition of the thread and need to try that on some of my cards. I love your cards and your different layouts! Love all the colors. Thank you for the comment that you "are not limited by colors." It gives me permission to go 'outside the box' as I am such a box person. Happy Anniversary Altenew! Colors and flowers make me happy too. I love all your cards and that pocket banner is so cool. Congrats Altenew and thanks for sharing your creativity with us! what beautiful colors and beautiful cards! Beautiful cards! I love the flowiness of this stamp set. I like how you used the pocket banner die on each card. Each looks so different. Oh I LOVE the purples. These are STUNNING!! These cards are exquisite!! Love the color combinations. I like the texture of the base cardstock used in all of your card examples! The flowers are beautiful colorful accents atop them! Lovely, lovely colors! 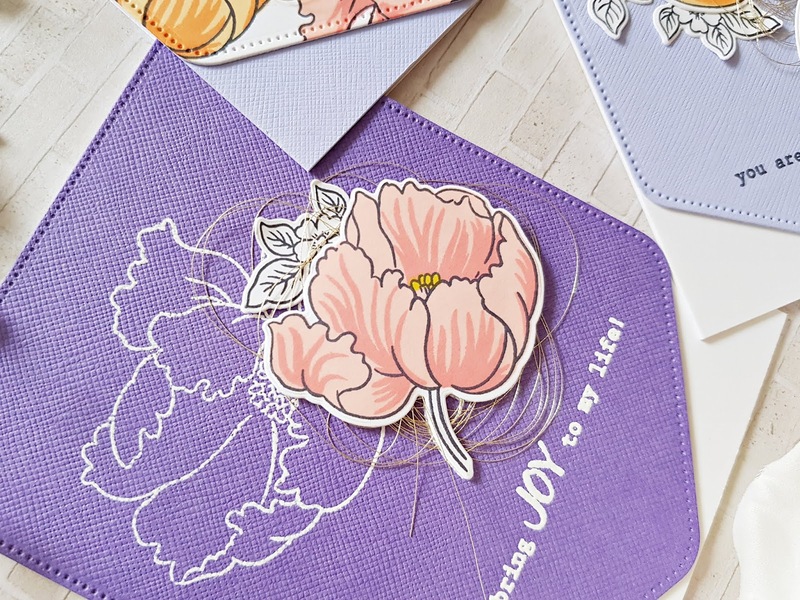 Beautiful cards and designs, love the soft colors for these pretty poppies! These are gorgeous! I love that soft purple color! Happy Birthday Altenew! 5 years! WOW! Amazing. THANK YOU for all your inspirations!! Wow! Lovely accents and details on your cards! Happy 5th Birthday to Altenew, WOWZA just love you're cards! Such bright and happy cards. Thank you for sharing your talents with us. I love your coloring in this beautiful card! Pretty cards - cool idea using the metallic thread. I'm loving all these different works of art everyone is sharing on the blog hop. Love them! I love these "pockets full of poppies" 😉 Poppies are one of my favorites and I almost named my daughter that (my hubby didn't buy into it 😕) especially after seeing the poppy fields in full bloom here in CA. This year is one of the best yet! Love and sooo love your cards especially the layering with the point, and the colors,oh my!! This will sound sort of silly, but your cards remind me of my Grandmother's hankies as she always folded them to a point whether in her dresser or her sleeve Haha!! Love your colors.....very pretty. Thank you for sharing. All three cards are gorgeous! Love the colors. Love the soft colors to this card. Oh I love your cards all three of them are different and you created different looks with the die cut. Very creative. thank you for sharing your talent with us. I am always drawn to poppies so of course I loved these cards. Love how you don't constrain yourself to traditional poppy colors. Beautiful cards! Such pretty pastel colors and cards!! So lovely! Very pretty cards and the colors look beautiful together! It is good to see what is possible. Very pretty cards! I love the colors! Love the cards, such a cute idea! Thanks for the inspiration! Great inspiration for this AWESOME Altenew blog hop! Wow! Love the colors, beautiful cards! Congrats Altenew! gorgeous cards! I need that banner die in my life! Beautiful card ! I loved the use of banner die ! Looks amazing. Beautiful cards! I especially loved the one with whole cover filled with flowers. The white text on a black paper strip is perfect addition to it. Lovely color scheme. Such beautiful color choices. Thanks for sharing your creative cards. Thank you Your cards are so dainty and the use of pastel colors make it stand out. Wow what a lovely idea. Such Beautiful Cards! Happy Anniversary Altenew. I have all males in my life - all brothers and sons... so I tend to make masculine cards a lot. I love the softness of yours. 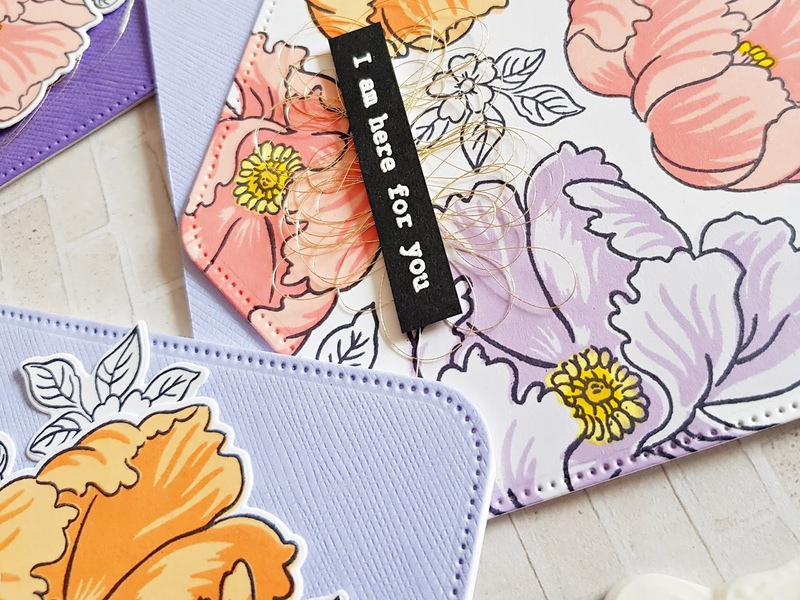 Your cards are very pretty and the pocket banner die is truly awesome. Such beautiful cards! Thank you for sharing! amazing cards! Love the purple and orange together. What a pretty combination of colors! Happy Anniversary to Altenew! 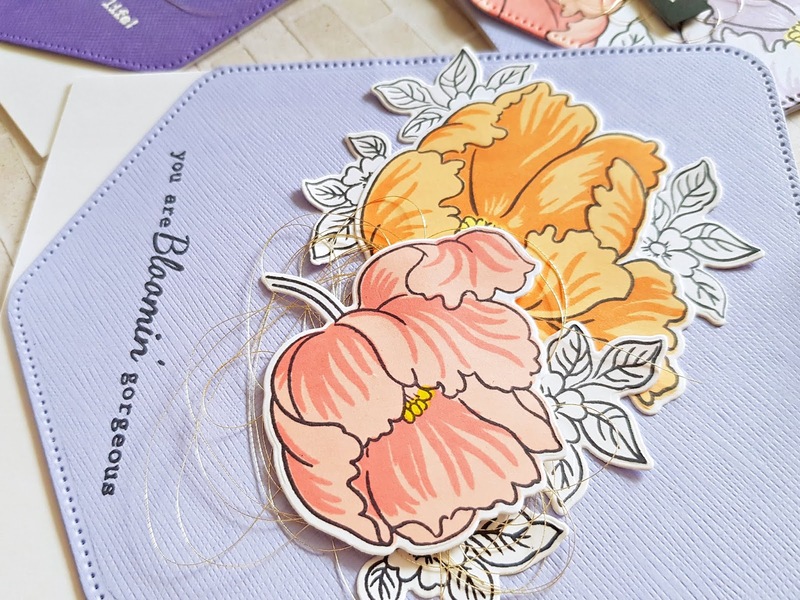 Thank you for showing the many different ways this gorgeous stamp set can be used. I sometimes have trouble imagining multiple ways to use stamps. Love the colors you used too. Your cards are stunning and love your color palette! I love the colors you chose! Beautiful cards! Your cards are beautiful, the purple is my favorite! Thank you. Wow! I love all the options you created with this one set! The colors are amazing! Thanks for the inspiration! Beautiful cards! I love the poppies and I love all your color choices for them! Lovely poppies, they do grown in other colors besides orange. Artistic freedom is always the way to go. I like the way you have used the same set of stamps to make 3 very different and lovely cards. I like the colors you chose ! They surely look so pretty together ! Beautiful group of cards! Love the color choices!! Such a gorgeous set of cards!! Your cards are beautiful! Love the stamping, the use of textured cardstock, and that pocket die! Just wow! Happy Anniversary to Altenew! Interesting textures and details (like the tiny metallic thread). Unique and creative. Thank you. Love the use of the banner on the card front! I love your layered stamping where you only used a couple layers. I have to try that technique! The pocket die you used really created unique cards. All three cards are super nice. LOVE the cards. The stamp is beautiful! Lovely cards! gorgeous shades of purple. Thanks for sharing and congrats to Altenew! Well done Altenew! And congratulations! I really love your wonderful projects - especially your pretty flowers. Thanks for the beautiful card inspiration! Love the non-traditional colors you chose! What a awesome cards and such gorgeous colours you used. Thank you Zsoka, for your inspiration and participating in this great Altenew 5th Anniversary party. Purple, light pink, and orange isn't a color palette I normally go for, so I appreciate seeing it in so many forms here. How lovely this all turned out. Thanks for sharing with us! Love the use of the purple/violet colors! My favorite! Clever details and use of embellishments. I really like the outline emboss. Awesome cards! I love the beautiful color palette! What lovely cards. I love that poppy stamp set. Gorgeous colors. Your colors are lovely! Beautiful cards, thank you! Lovely Spring colors. You shared how versatile a set can be. Thank you for the inspiration. Happy Birthday, Altenew. Your cards are so lovely...the colors look so pretty together! Love that Altenew stamp set! Happy 5th Birthday, Altenew! OOOOH MAN! Those are AWESOME! Definitely my favorites! Love the color combos you used on these cards! Congrats to Altenew, and congrats to the design team on so many beautiful projects! I love all three of your cards. The colors are so pretty and happy reminding me of spring! I just love your cards, you did an awesome job! Thank you for sharing them! such a beautiful trio of cards! Zsoka, I love the beautiful cards! Great colors. Such beautiful cards! Love the banner style, and the soft color combos. Thanks for your inspiration! Beautiful cards! Love your wonderful coloring and amazing style.